A contraflow on the M20 to ease congestion when Operation Stack is implemented would be an "unacceptable risk", Highways England has said. 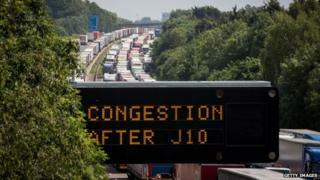 The operation involves parking - or stacking - lorries on the motorway when cross-Channel services are disrupted. Lorries have been parked on the coastbound carriageway of the motorway on 21 days over the past three months. MP Damian Collins said: "Highways England need to come up with an alternative solution." In a statement, Highways England said: "We have decided a contraflow would present a significant and unacceptable risk to the safety of road users and anyone required to work within it. "Using freestanding cones - the quickest way to set up a contraflow - to separate lanes of traffic for a long stretch of a motorway would expose drivers to the risk of collision with oncoming traffic. "Any incident within the contraflow would be difficult for emergency services to access and could cause severe and unpredictable delays." Mr Collins, the Conservative MP for Folkestone and Hythe, said: "If it doesn't happen, Highways England need to come up with an alternative solution. "The contraflow proposal which was on the table at the summit meeting last Friday was proposed by Highways England. "It's not just for them to pass judgement on ideas - it's about time they came up with ideas of their own." In response, Highways England said it had not agreed to a contraflow at the meeting - it had agreed to look into the possibility of putting one in quickly. It said it would continue to work with everyone to find alternatives, but safety "was the biggest factor". The Freight Transport Association said the rejection of the idea of a contraflow on the M20 was "extremely frustrating". Phillip Gomm, from the RAC Foundation, said: "A contraflow is worth trying. We see situations where cones keep vehicles apart, and we have average-speed cameras installed to manage the flow of traffic." Operation Stack: Is there a political solution?